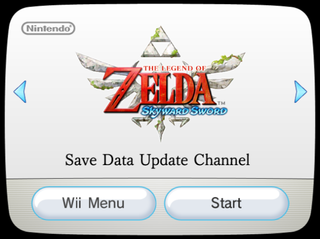 The Legend of Zelda: Skyward Sword Save Data Update Channel is a channel to fix a bug in The Legend of Zelda: Skyward Sword that could corrupt your save data. For some reason, many Animal Crossing: City Folk leftovers are present. Everything in Item/item.arc/Res/ and Item/item.arc/dsnPltt.brres contains patterns from the game, plus color palettes. AddItem/addItem.arc contains 256 items consisting mainly of cardboard boxes.